Joaquim Rodriguez (Katusha) underlined that he is ready to fight for the overall win in the Vuelta a Espana when he won the battle between the best climbers on the very steep Alto de Sotres in stage 15 of the Vuelta a Espana. With a powerful acceleration 1.5km from the finish, he dropped all his rivals and crossed the line 12 seconds ahead of Rafal Majka (Tinkoff-Saxo), with Daniel Moreno making it two riders for Katusha on the podium. Fabio Aru (Astana) could only manage 5th but it was enough to defend the lead by a 1-second margin over Rodriguez. In 2012, Joaquim Rodriguez missed out on the overall victory in the Vuelta a Espana at a point where he seemed to have secured that elusive grand tour win. Since then, he has not been in real contention for the victory in a three-week race and many believed that it was too late for the Spaniard. 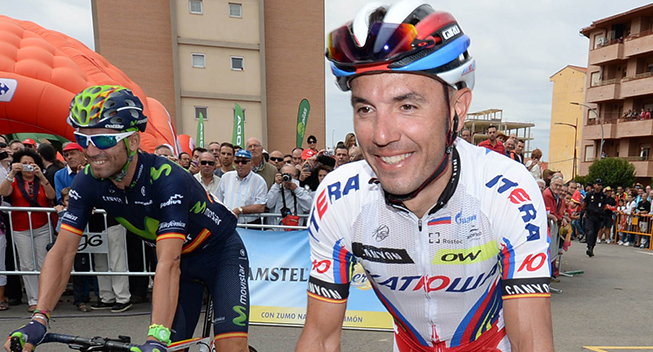 However, it looks like the 2015 Vuelta a Espana could offer him another chance to chase the overall victory. After a solid and consistent start to the race, he proved that he is ready to challenge Fabio Aru when he took an impressive solo win in today’s big mountain stage to the top of the Alto de Sotres. Yesterday Rodriguez said that he feared that he would lose a lot of time as he was not comfortable on the final high-speed climb. In the end, he even gained one second on Aru and this put him in the perfect position to strike when the riders headed into much steeper terrain in today’s stage. At the bottom of the final 12.6km climb, a 9-rider breakaway with Maarten Tjallingii (LottoNL), Dominique Rollin (Cofidis), Pierre Rolland (Europcar), Blel Kadri (Ag2r), Brayan Ramirez (Colombia), Berhane, Haimar Zubeldia (Trek), Nikolas Maes (Etixx-QuickStep) and Ricardo Vilela (Caja Rural) had an advantage of 1.10 after Movistar had led the chase all day. Maes was distanced right from the bottom where Kadri opened the attacking. Berhane joined him but they were unable to get a big advantage. Tjallingii and Rollin had been distanced when the pair was brought back and instead Ramirez took off. However, Zubeldia was just riding his steady pace and the Basque turned out to be the strongest. He passed the fading Colombian while Berhane took off in pursuit followed by Vilela and further back the trio of Ramirez, Rolland and Kadri. In the peloton, Movistar had now upped the pace with Andrey Amador and Javier Moreno who immediately made the group explode to pieces. It was down to 40 riders when they swung off and left it to Luis Leon Sanchez to set the pace for Astana. The Spaniard barely took a turn before Nairo Quintana (Movistar) launched a long-distance attack. Sanchez joined him but they never got much of an advantage. Dario Cataldo slowly reeled them in for Astana and then Sanchez again started to ride on the front. Tom Dumoulin (Giant-Alpecin) had briefly been dropped but he made it back to the group as the pace went down. Boswell, Nieve, Henao, Pozzovivo, Sanchez, Cataldo, Landa, Rosa, Aru, Arroyo, Madrazo, Brambilla, Verona, Elissonde, Oliveira, De Clercq, Visconti, Valverde, Quintana, Meintjes, Chaves, Cardoso, Sicard, Jeandesboz, Dumoulin, Losada, Rodriguez, Moreno, Majka, Hansen, Poljanski were the riders left after another group with Madrazo, Visconti and Arryo had also made ti back. The attacking had brought the gap down to 45 seconds but the strong Zubeldia managed to increase the gap to 1.10. Meanwhile, the rest of the early break was gradually brought back, with Berhane being the final rider to get caught 7km from the finish. In the flat middle section of the climb, the gap stayed relatively stable while Sanchez just continued to ride on the front. However, Movistar again took over with 6km to go when Giovanni Visconti took over the pace-setting and he gradually reduced the gap which was down to 45 seconds one kilometre later. Madrazo and Arroyo were the first to lose contact but it was when Diego Rosa took over for Astana tat real gaps started to open. Dumoulin and Meintjes had to close a small gap as lots of riders were getting dropped. Dumoulin was distanced for good a few moments later where Zubeldia was just 5 seconds ahead of the peloton. Rosa swung off and left it to Cataldo to set the pace but it didn’t take long for the attacking to start when Nieve took off. The Basque passed Zubeldia but never got much of an advantage and ti was a front group with the Sky rider, Valverde, Quintana, Majka, Moreno, Poljanski, Rodriguez, Aru, Landa, Pozzovivo, Chaves, De Clercq and Meintjes that gathered. Poljanski went straight to the front to set the pace for Majka while Dumoulin was fighting hard just 11 seconds behind. Poljanski continued to ride on the fornt until Rodriguez made his attack with 1.5km to go. Quintana, Landa, Aru, Moreno and Majka managed to follow him but when the Colombian cracked, Rodriguez got a small advantage. Aru made a big surge, trying to get back, and for a long time, he and Majka dangled just 5 metres behind. However, the gradually started to lose ground while Moreno, Landa and Quintana had gathered further back. Nieve, Valverde and Chaves were next while Pozzovivo and Meintjes had combined forces. With 300m to go, Rodriguez started to gain a lot of ground and it was apparent that he ws going to win the stage. Meanwhile, Moreno, Landa and Quintana caught Majka and Aru. Rodriguez rode hard all the way to the line before he celebrated the win while Majka sprinted in for second in the exploding group. Moreno was third across the lin,e followed by Quintana and Aru. Dumoulin reached the finish with a time loss of 50 seconds. Rodriguez’ gains were not enough to take the overall lead but he is now just 1 seconds behind Aru as he goes into the final summit finish of the race. Stage 6 includes o less than 5 climbs on a day of constant ups and downs before the riders get to the difficult finale. Here they will tackle the steep Alto de la Cobertoria and Alto Ermita de Alba in quick succession. The final climb is extremely steep as it averages 11.1% over 6.8km. After yesterday’s big mountain stage, there was more climbing on stage 5 which brought the riders over 175.8km from Comillas to a mountaintop finish on the category 1 Alto de Sotres. After a flat first half, the second part was a bit hillier with some smaller climbs and a category 2 ascent 60km from the finish. However, it was the final 12.7km ascent with an average gradient of 7.9% that was expected to do the damage as it had double-digit gradients for the final three kilometres. It was a perfect day for a bike race when the riders gathered for the start. All the riders that finished yesterday’s stage were present as they rolled out for their neutral ride. With two days of breakaway success, it was no surprise that the race got off to another frantic start with lots of attacks. That was too much for Boy van Poppel (Trek) was dropped almost right from the beginning as the attacks kept flying. At the 11km mark, Blel Kadri (Ag2r), Maxime Monfort, Jelle Vanendert (Lotto Soudal), Amael Moinard (BMC), Kristijan Durasek (Lampre-Merida), Natnael Berhane (MTN-Qhubeka) and Sylvain Chavanel (IAM) got a small advantage but Etixx-QuickStep were chasing hard as they had missed the move. Vanedert was dropped and fell back to a chase group that included Rodolfo Torres (Colombia), Tosh van der Sande (Lotto Soudal), Antoine Duchesne (Europcar) and Carlos Verona (Etixx-QuickStep) but they made it back to the leaders to make it an 11-rider group. The gap was only 10 seconds and now Movistar took over the pace-setting. That was enough to bring the break back and the attacking continued for a long time. After 40km of fast racing, the elastic finally snapped when Maarten Tjallingii (LottoNL), Dominique Rollin (Cofidis), Pierre Rolland (Europcar), Blel Kadri (Ag2r), Brayan Ramirez (Colombia), Berhane, Haimar Zubeldia (Trek), Nikolas Maes (Etixx-QuickStep) and Ricardo Vilela (Caja Rural) got clear. They had to work extremely hard to extremely hard to get a bigger advantage but finally, they peloton took a breather and allowed the gap to grow. It went out to 3.08 before Movistar hit the front at the end of a first hour during which more than 49km had been covered. They kept the gap just below the three-minute mark for a while before they slowly accelerated. At one point, the gap was down to 1.52 but it was too early to catch the escapees and so they allowed the gap to go out to 3 minutes again. In the feed zone, it was 3.20 and it was four minutes when they hit the first climb. As they went up the ascent, the Spanish team accelerated and they had brought it down to 2.55 when Rollin led Rolland and Tjallingii over the top. After the climb, the Spanish team again slowed down and while Rory Sutherland and Francisco Ventoso rode on the front, the escapees were riding faster. Hence, the gap had gone out to 5.05 when Rollin surprised Maes in the intermediate sprint after the Belgian had accelerated to take the points. Imanol Erviti and Jose Joaquin Rojas also started to work for Movistar as they entered the final 40km and this had a big effect. With 35km to go, the gap was 4.10 and it was 3.40 when they entered the final 30km. Riders were getting dropped as they headed up a small, uncategorized climb and Movistar were not slowing down. With 21km to go, they had brought the gap down to 2.20 and they didn’t wait for their teammate Amador who had to spend some energy to rejoin the peloton. With 17km to go, the Costa Rican was back in the group as they hit a small climb where Sutherland ended his work and was one of many riders to get dropped. At this point, the gap was only 1.50 and as they hit the climb four kilometres later, it was only 1.10, making it clear that the breakaway would have no chance.